Everyone should be growing mint! Mint is a plant that needs almost no description. It is a small, running, highly aromatic, perennial herb. The leaves have been used for thousands of years in culinary and medicinal applications. Very useful in forest gardens to cover large areas under trees, protecting soil, and providing food and shelter for beneficial insects. I have always considered this a must-have plant, and usually have one or two clumps or pots growing somewhere. I currently have one potted plant and one jar full of cuttings just taking root. 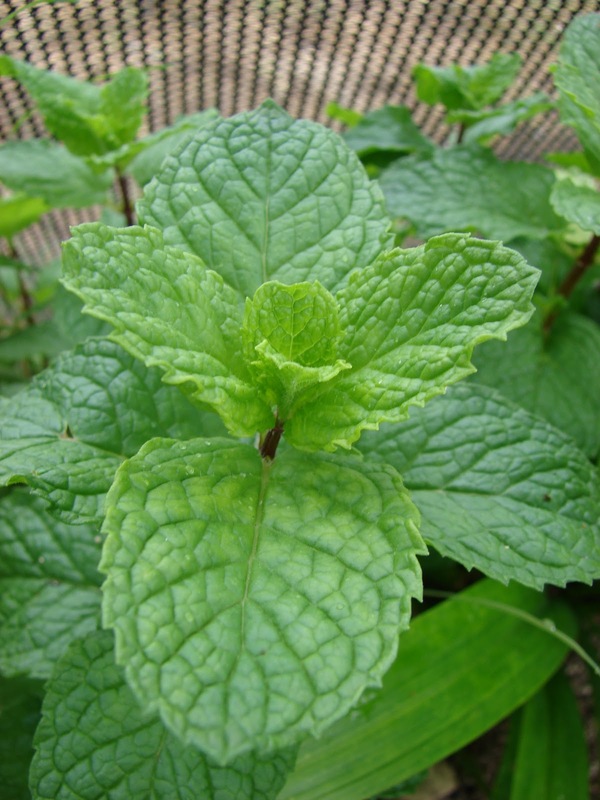 Spearmint, Mentha spicata (aka M. viridis) is one of the best known Mints. There are between 13 and 30 recognized species of mint and about as many hybrids; it all depends on who is citing what research. It is hard to identify where these herbs originated as there are species on every continent. I can only assume that this plant had its origins in Pangea before the continents separated! 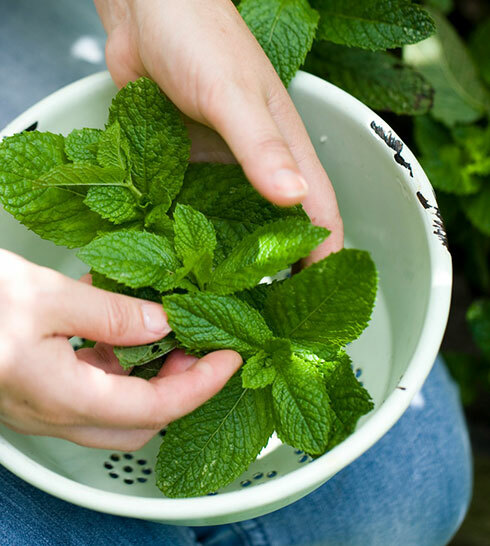 Most cultures in places where mints grow have used mint in culinary and medicinal ways for thousands of years. Many anthrobotanists (those who study plants in cultures and society) believe that it is almost impossible to find many species of mint that have not been influenced by the people living nearby… a co-evolution of plant and society. “Mint” comes from the Greek word minthe. Minthe, a nymph in Greek mythology, was transformed into a plant by Queen Persephone just before Minthe could be seduced by Hades (aka Pluto, the god of the underworld). Unable, to undo the curse, Hades was at least able to give her a sweet scent. Mint oil can be used as an insecticide. 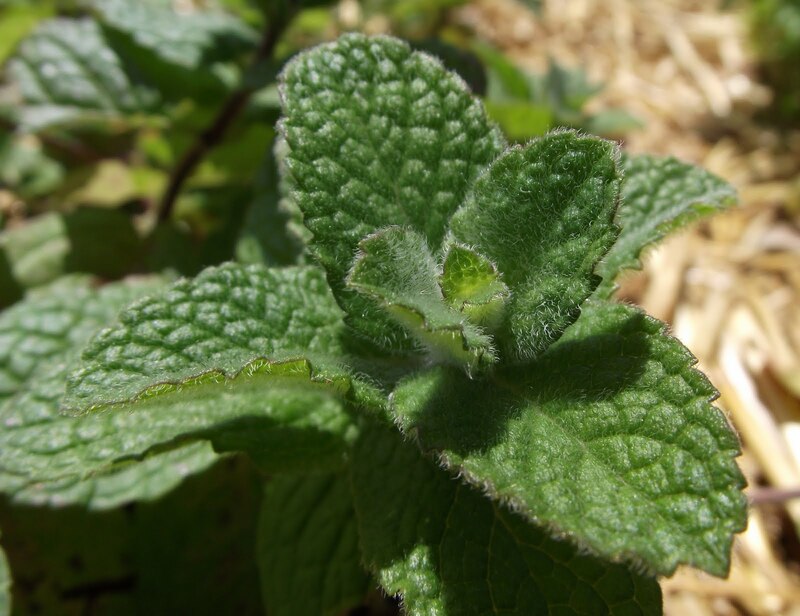 Many of the common cooking herbs are in the “Mint Family”, Lamiaceae, including rosemary, basil, sage, and oregano. Peppermint, a hybrid, has been dated as far back as 10,000 years! Fresh mint, just before flowering, is the best mint to be used. 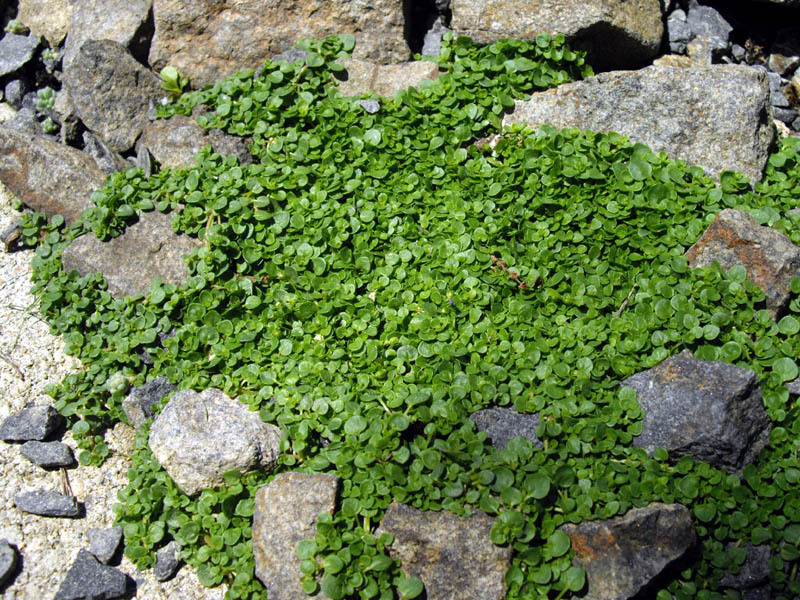 Corsican Mint, Mentha requienii, looks and behaves quite different than its relatives. Mentha longifolia – Horse Mint (Zone 4-10): Great ground cover. Can tolerate light foot traffic. 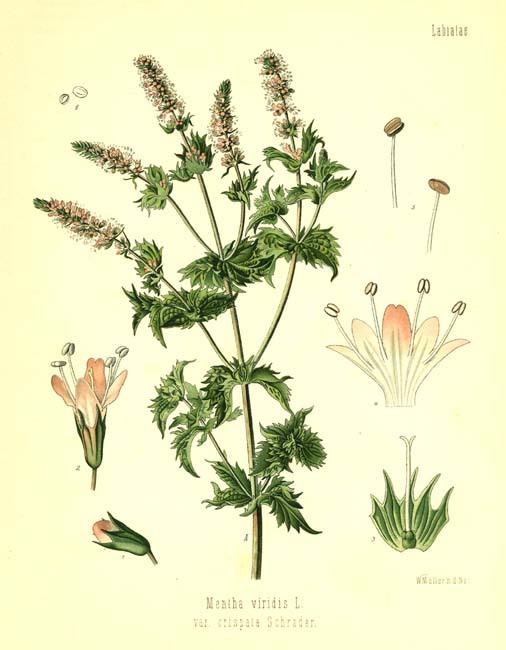 Mentha pulegium – Pennyroyal (Zone: Traditionally used in teas and foods, but the concentrated essential oil is highly toxic. It has been used as an abortifacient, sometimes with tragic results. Mentha suaveolens – Apple Mint (Zone 6): Great ground cover. Can tolerate light foot traffic. 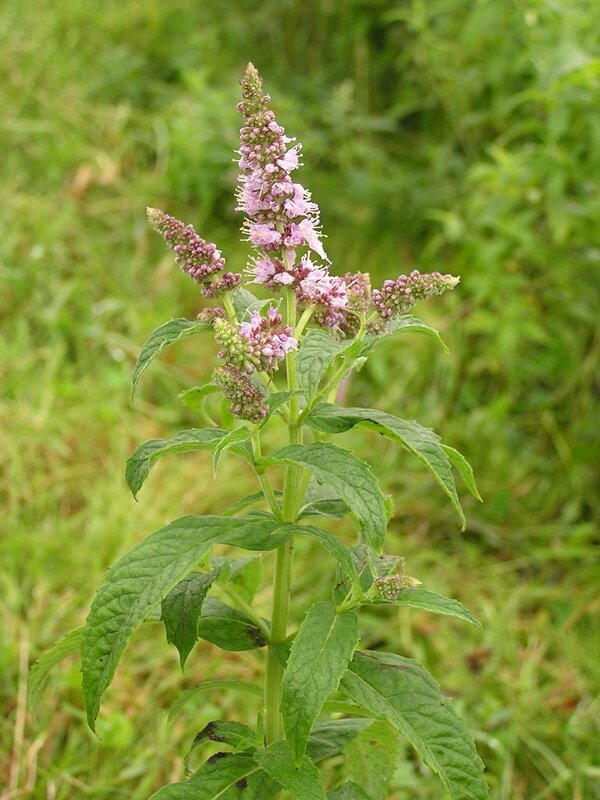 Sometimes known as wooly mint due to its hairy/downy leaves. 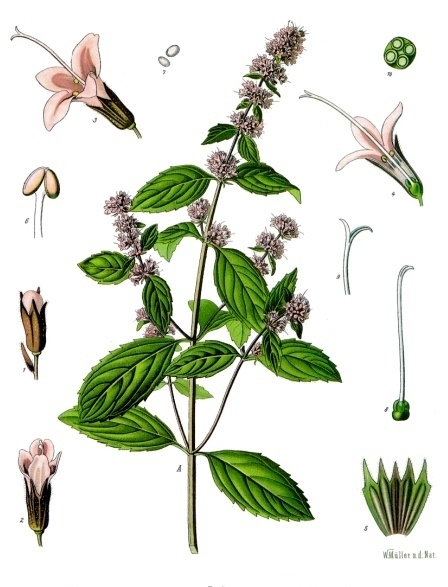 Mentha x piperita – Peppermint or Chocolate Mint (Zone 3-10): Cross between Water Mint and Spearmint. One of the best known and widespread mint plants. 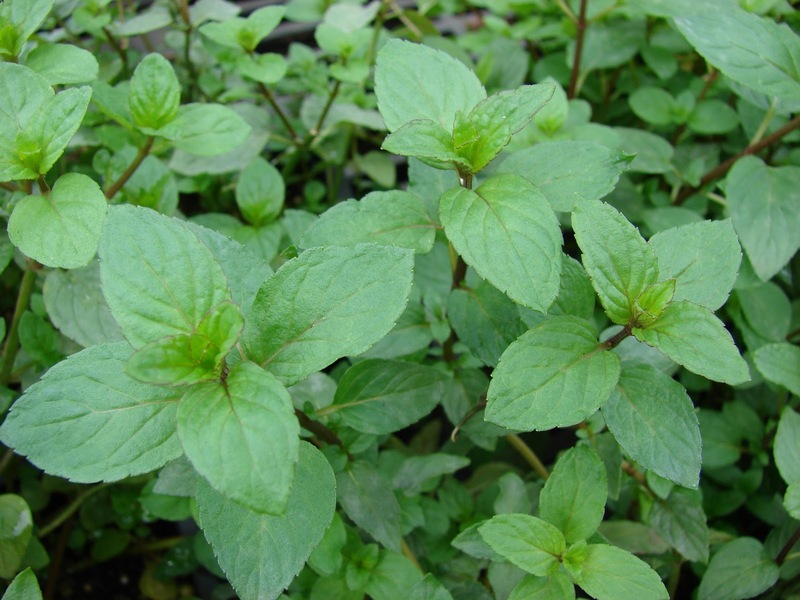 Mentha x villosa – Bowle’s Mint or Cuban/Mojito Mint (Zone 6): High shade tolerance. Not a good individual ground cover. Storage: Fresh leaves do not last long. I often will keep a bunch sitting in a glass of water in the kitchen window for up to a week. Leaves or sprigs can stay in the refrigerator, wrapped in a damp paper towel in a plastic bag, for 3-4 days. 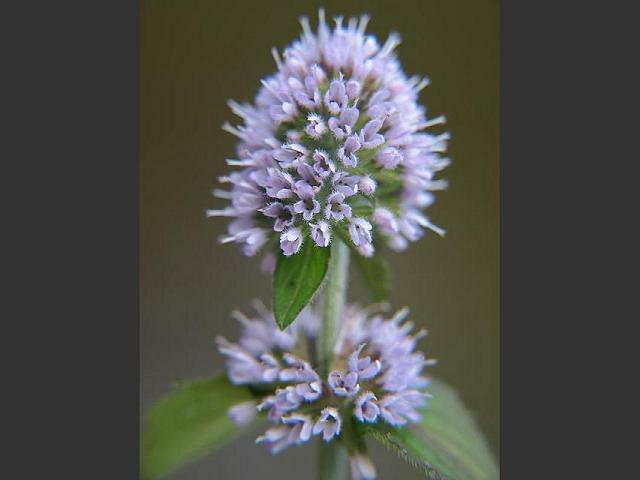 Mints have tiny flowers, like this Water Mint, Mentha aquatica, but vary from purple to white. Cultivars/Varieties: Many species and varieties available. Horse Mint, Mentha longifolia, is a great ground cover. Propagation: From seed, but can be more difficult to germinate. Roots easily grow from stem or root cuttings placed in water. Once adequate roots form, the cutting can be potted. I have found cuttings to be the easiest method by far. The Mojito may be one of my favorite summer drinks – just make it with lots of mint! Place the mint leaves into a tall glass. 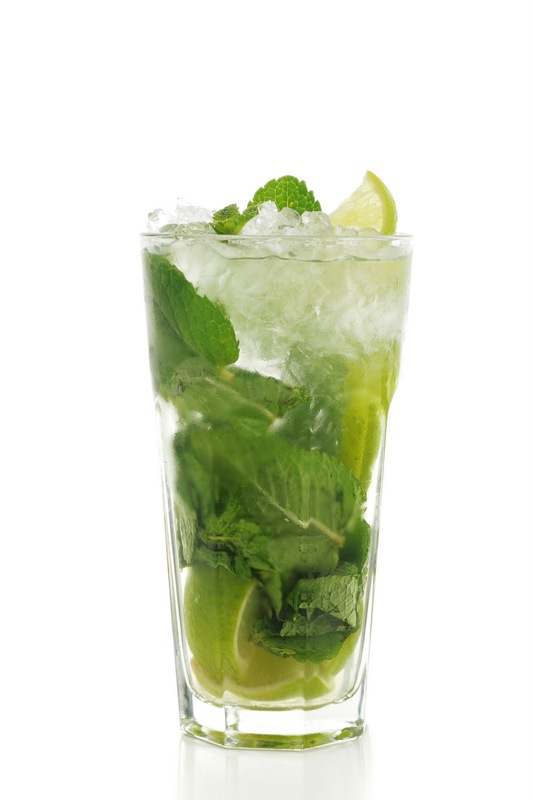 The traditional Mojito glass is the “Collins” glass. Squeeze lime juice over the leaves. Smash the sugar into the leaves with a muddler (or back of a wooden spoon).